Hello there! 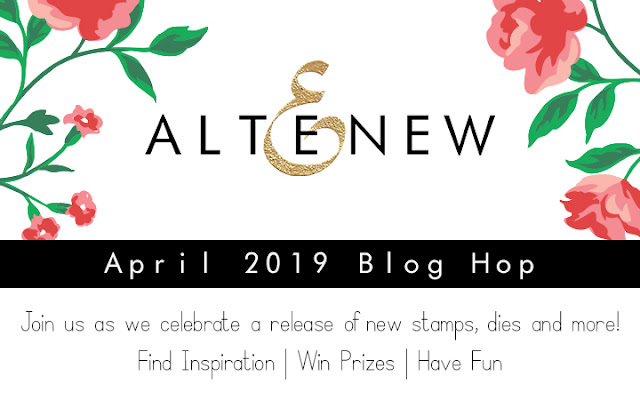 Thank you so much for stopping by my portion of Altenew's April 2019 Release Blog Hop. We've got tons of stamps, dies, stencils, and paper packs to get into so let's get started! If you didn't start at the Altenew Card Blog make sure to go back for more inspiration and chances to win! To celebrate this release, Altenew is giving away a $50 gift certificate to 6 lucky winners! Please leave a comment on the Altenew Card Blog and/or Altenew Scrapbook Blog by 4/22/2019 for a chance to win. We’ll also draw a winner to receive a $20 gift certificate from the comments left on each designer’s blog on the blog hop list below. All winners will be announced on the Altenew Card Blog on 5/4/2019. Another must have from this release is the Fancy Hello Die. 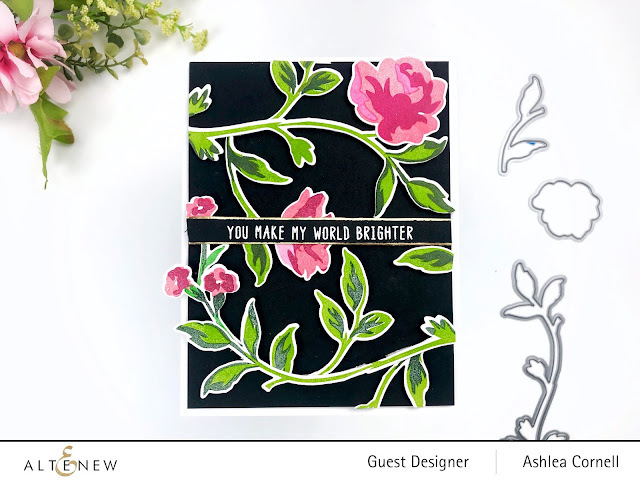 I love it because, obviously, it's fancy, but also because the size is perfect to either add to a stamped sentiment or to be the focus of the card as I used it here in this example. Also featured on this card are some cut outs from the Summer Garden 6x6 Paper Pack. If you're a card maker like I am, there are some incredibly great images included in this set that are just begging to be cut out and added to a card front. Another set that I know you'll just love is the Beloved Daisy stamp set. This set layers so beautifully and the three flowers that you can create go together so well. I paired the set with the Versatile Vases set and created a quaint bouquet. There's tons more to share but I know you're dying to get moving along the hop. Check out the full hop list just below the supply list. Your next stop is Virginia Lu ! Thanks again for stopping by! Wow! Thanks for the amazing inspiration! I love the new release. It is just fantastic! gorgeous designs Ashlea! 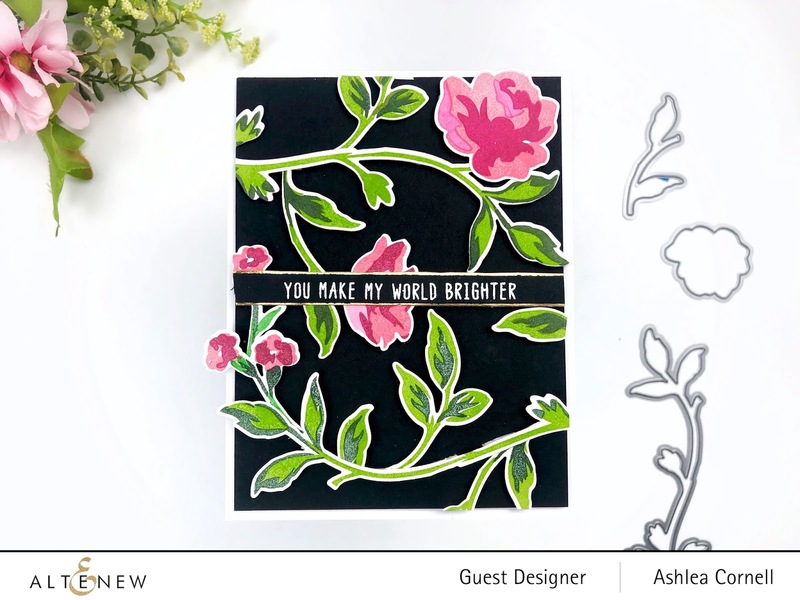 Love the new pretty floral sets, you did a great job showcasing them and those solid image stamped examples are fantastic! Thanks for sharing! Loving all your pretty creations! I love all of these cards. The daisies in the vase is my favorite. The colors are beautiful. Great job Ashlea! 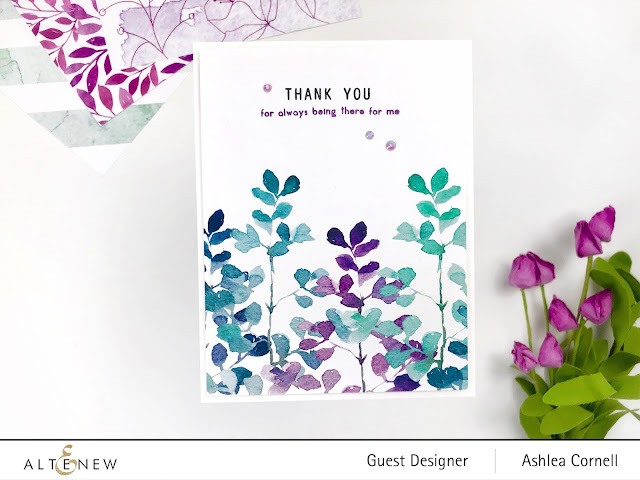 I just love how you have used the vase on the one card, and your combination of colours is just too gorgeous. Thanks for sharing. The detail on these is crazy gorgeous! I love them! Wonderful ideas using the great new Altenew products! Goodness, these are all just beautiful! Beautiful cards!! They look darling!!!! All of your cards are beautiful but I am in love with those daisies! Gorgeous!! So many pretty flowers and creations. Fabulous job. These are all gorgeous!! I think my favorite it the second from the bottom, the thank you card; so beautiful! Nicely done. Love the thank you card colors. 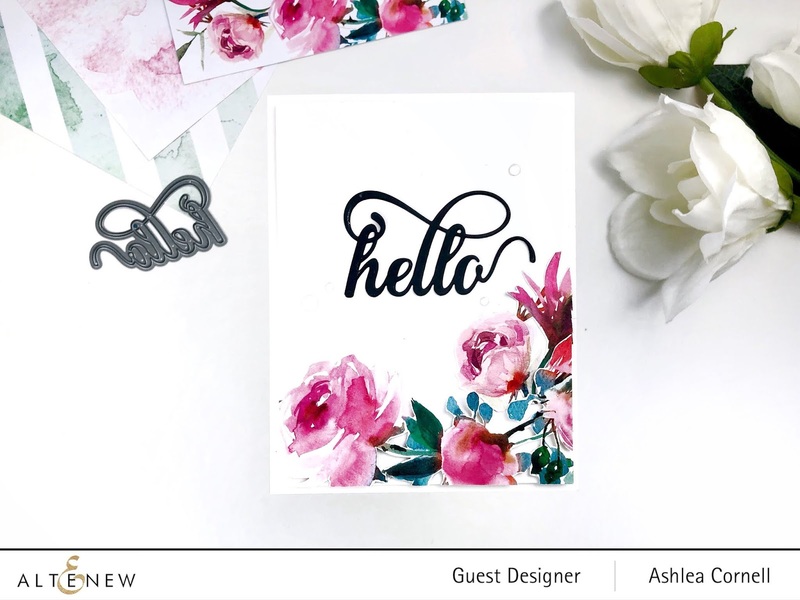 Loving this new release - especially the beautiful rose spray stamp set & that fancy hello die. Thank you for the lovely inspiration! love your cards specially the daisies one! Beautiful creations! I love the flowers! I love the new papers! Great color choices! These are lovely. I really like the card stamped in orange with the vellum overlay. The video was very helpful. First of all the daisy card blew my mind. The vase looks so real!!! You did a great job! I also just love, love, love, the thank you card! Your cards are beautiful and colorful! I especially love the colors on the thank you card. thanks for sharing. Beautiful cards, love your techniques and your video. Love the ideas for the stamps and the use of the solid stamps. Using the light shade for background or shadow interest is a tip I will use. Love all of your cards! Each one is unique and I would be thrilled to find anyone of those in my mailbox. Your cards are beautiful, thanks for all the ideas. The HELLO die is so pretty! So much to choose from. Personally like the Watercolors set too. One is more prettier than the next and love the colors from the thank you card! Wow, you certainly had fun with a lot of those fabulous products from the new Altenew release. Love all of your cards, particularly as they are all so different. I also love that you've left a leaf hanging off the edge of the card with the daisies in the vase. Most designers cut off the overhangs, but I think the design looks so much more natural when they're left on. I always leave my overhangs because I love the look. Thanks so much for sharing and giving us the chance to win. Fabulous cards. Love the vase of daisies. Thanks for sharing your time and talent with us. Gorgeous cards, Ashlea! I love the Watercolor set and that beautiful 'hello' die! Thanks so much for sharing the wonderful inspiration! Wow..your cards are just Amazing ! I loved the cleans and fresh look of your cards and the black one is stunning !! Beautiful use of new paper pads. I love all of cards!! Wonderful job!! Great cards. Love the black and contrasting color! Gorgeous cards! I love the hello and thank you cards! Love your design style! Beautiful new release from Altenew! And, your cards are gorgeous. So much inspiration!!! Love all your designs and I agree there's so much that can be done with the watercolour stamp! beautiful, beautiful cards. You make card making look easy. Your video was fantastic! I loved all the hints and the results you got. The additional cards are beautiful. thanks so much for sharing all that awesome information! I can see that stamp set is a must have! I love every single card you made!! Thank you so much for sharing your talent on the blog hop. All your cards are lovely. My favorite technique that you used is the shadow stamping. It makes a great looking background for a card. Thanks for your help. Wonderful cards, colors, and new release! Beautiful cards. I loved what you created with Beloved daisy set. These are all so pretty! The daisies are a favorite! Lovely card ideas! You showed some great techniques in the tutorial, and my favorite was the misting technique. I like the impressionistic look it gives. I also like the cards using the paper packs - such fabulous colors and designs! Love all of your ideas. I never know what to do with solid stamp images. You rocked it! All your cards are beautiful. Thanks for sharing your techniques' via process video. Another outstanding release from Altenew. All the cards are really elegant. Oh i love tehm so much . Thank u for doing justice to the release. Such gorgeous cards! Thanks for sharing. I like your video Ashlea - this is great inspiration for solid sets! Beautiful designs and colors and techniques. Tickled to see so many projects in your video and then even MORE here on the blog featuring the Altenew April release:)) Beautiful stamping Ashlea! What a great collection of cards. I particularly like the ones where some portion of the flowers comes off the edge of the card. I just really like the excitement and movement that gives a card. Thanks for sharing! Your cards are lovely. I struggle with solid image stamps. Thank you so much for ideas on using them, it was very inspiring. I especially love the watercolor technique. 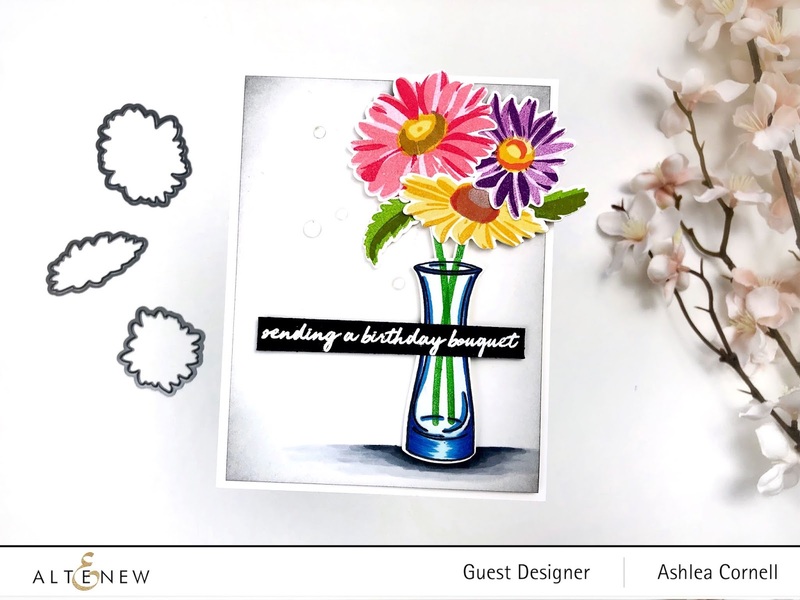 Thanks for the video showing the watercolor floral stamps. This is a fantastic release with so many great new products. Love them all! Beautiful cards. Thanks for sharing. Loved your video..especially the watercoloring with stamps!! Wonderful inspiration!! I actually usually avoid solid stamps, but you've just shown some awesome cards using them in different ways!! Wow, absolutely stunning designs! Gorgeous projects! Beautiful! Especially love your birthday bouquet! Awesome release! Wonderful creations! I especially love the lovely pink flowers against the black background, it is very striking! Beautiful cards. Thanks so much for showcasing the Study in Watercolor set. I must admit in the midst of this wonderful release I had not paid much attention to that one. Now I know I definitely need some solid image stamps in my stash! Wonderful cards - I especially love the vase of colourful daisies and the fabulous colours you used for the thank you card - lovely! luv it when you can get some great images from the patterned paper to use in other ways. Nice, clean & simple. Beautiful cards. These are beautiful! Love the card with the vase and your floral arrangement on the dark background! My favorite is the beloved daisy set and the sold out versatile vases. So adorable together. I adore all of your cards and the daisies stamp Set is my fav! I love how you easily created a beautiful card with a Die and cutout patterned paper! Thanks so much for the inspiration!